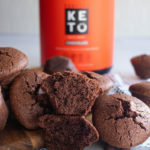 These gluten-free, dairy-free, dark chocolate low-carb muffins are so incredibly good for you and anyone following a keto diet. With 12 grams of protein per muffin and a net carb count of 4 grams, these snack-sized treats will exceed your expectations of what you thought was a decent grain-free muffin. Whey protein is notorious for helping you build lean muscle mass and drop unwanted fat, but what about other health benefits, like heart health? Whey can help lower triglycerides while improving insulin sensitivity, blood sugar levels, and blood pressure[*][*][*]. Almonds are also associated with heart health because of their high vitamin E content. In one study on healthy (asymptomatic) men ages 20-70, 50 grams of almonds per day for four weeks showed some impressive results. According to the study, eating almonds not only increases your vitamin E antioxidant levels but also improves vascular function[*]. This is great news for heart health. Almond flour is also gluten-free and grain-free, which can be easier on your digestive system and less allergenic than many grains (unless you’re allergic to nuts!). Eggs — contrary to some outdated opinions — are actually incredible for your heart. One small pastured chicken egg contains a massive amount of nutrients for its size, including vitamin K and omega-3 fatty acids. The vibrant orange center of an egg also includes the antioxidants lutein and zeaxanthin, which are known for making your eyesight stronger[*]. But it turns out that at least one of these potent antioxidants also support heart health. Lutein may lower inflammatory blood markers associated with coronary artery disease. And inflammatory markers like interleukin-6 (IL-6) are better indicators for heart disease than LDL cholesterol[*][*]. Coconut oil, despite its high saturated fat content, is also great for your heart. In fact, it’s coconut oil’s fat content that makes it so heart healthy. Coconut oil can raise your HDL or “good” cholesterol levels and lower your LDL or “bad” cholesterol levels[*], and shows promise lowering blood pressure in rat models[*]. The ketogenic diet is one of the best diets for fast and sustainable weight loss. Most people think that’s because of all the fat you’re “allowed” to eat on a keto diet, but that’s just not true. Sure, coconut oil, MCT oil, and avocados are nutrient-dense and keep you feeling full. But protein is another critical component to weight loss that you shouldn’t ignore. And that’s where whey protein isolate comes in. Whey protein helps you to curb cravings and stay full for hours, which can lead to fat loss[*][*]. Whey also helps you maintain lean muscle mass as you lose fat[*]. Subbing almond flour for complex carbs may lead to weight loss as well. One study saw a greater reduction in weight, BMI, fat mass, and waistline while also increasing ketone levels[*]. Whey protein is also great for brain health. Whey is a complete protein, which means it contains all 20 amino acids — both essential and non-essential. And you need certain amino acids to help create and maintain neurotransmitters and certain hormones. One amino acid, in particular, helps to boost your mood and helps you sleep more soundly: tryptophan. It’s a precursor to serotonin — a neurotransmitter that helps regulate your mood and behavior, sleep, appetite, and even your digestion. More whey means more tryptophan, which could mean better serotonin levels[*]. Coconut oil — full of MCTs or medium chain triglycerides — is the perfect brain food. MCT oil may help improve your memory and overall brain health[*]. Brain fog? Add some MCT oil or powder to your meal or hot beverage. Or to your muffins. These decadent dark chocolate muffins are ready in under 30 minutes with just four simple steps. They’re perfect for those nights when you have a sweet tooth or mornings when blueberry muffins aren’t cutting it. First, preheat your oven to 350 degrees Fahrenheit and line a mini muffin pan with paper muffin cups. Butter or nonstick spray works as well. Set your prepared muffin pan aside. In a standing mixer or medium bowl with a hand mixer, blend your eggs, monk fruit sweetener, and vanilla, on high until the mixture is light and frothy. In a separate small bowl, mix the almond flour, protein powder, cocoa powder, baking powder, baking soda, and sea salt. Head back over to your mixing station and start blending your wet ingredients again, while carefully drizzling the melted oil, followed by the dry ingredients (in small batches) to the wet ingredients. Mix on low until everything is well incorporated and smooth. Turn off your mixer and gradually stir in the chocolate chips. Portion the batter into the prepared muffin or cupcake pan, filling each about ⅔ of the way full. Pop the pan into the oven and bake for 20-25 minutes or until you can poke a muffin with a toothpick and it comes out clean. That’s it! Enjoy these ooey gooey chocolate muffins and get a hefty dose of protein and healthy fats! These keto, low-carb, high-protein muffins will satisfy your sweet tooth and offer a healthy dose of amino acids from chocolate whey protein powder. Preheat oven to 350°F and line a cupcake pan with paper liners, nonstick spray, or butter. Set aside. Add eggs, sweetener, and vanilla to a standing mixer or large bowl. Mix on high for 1-2 minutes until light and frothy. Meanwhile, add dry ingredients to a small bowl (almond flour, protein powder, cocoa powder, baking powder, baking soda, and salt). With a mixer on low speed, slowly drizzle in melted oil then add dry ingredients to wet ingredients in 2-3 batches. Mix just until batter is smooth. Stir in chocolate chips. Divide and portion batter into prepared cupcake pan. Bake for 20-25 minutes until a toothpick comes out clean when poked through the center of each muffin. Allow them to cool on a wire rack to room temperature before eating.